Scene from the Mortuary Chapel of the noble Sennefer. 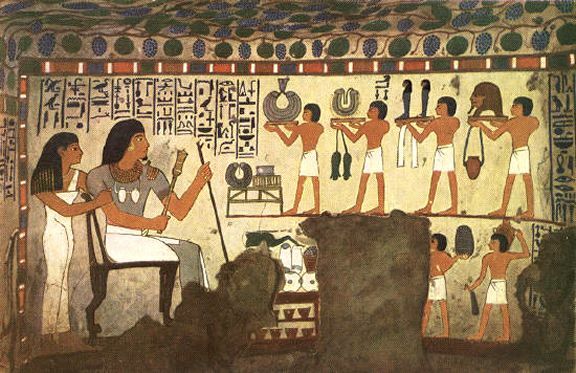 Sennefer and his daughter Mutty, who was a songstress of Amen-Ra, are seen standing to receive the servants who are carrying boxes and a bed for the use of Sennefer in the tomb. Further along, other servants are bringing the cartonnage head which fits over the mummy, the Ushabti figures, which were supposed to act as servants in the next world, collars, and other paraphernalia.